As we dig into the history of Victoria’s lost farmland, we see the impact both on farmers and on human health. Where we once grew blueberry bushes in healthy bogs, tomatoes on sunny hillsides or green beans alongside a salad patch waiting to be picked out of the rich, dark, naturally composted soil, thousands of customers now pluck cake mixes, instant pizzas and cereal boxes from grocery shelves. Subsidies to industrial farmers of commodities such as corn explain why, between 1985 and 2010, the price of high-fructose corn syrup drinks dropped 24 percent (increasing the rate of type-2 diabetes in children as they consumed more), while over the same period the price of fresh fruits and vegetables rose 39 per cent. As consumers buy cheaper, bland, prepared food revved up with salt and/or sugar – or beef fed on corn and other grains – they manage to convince themselves they can save time and money, without considering the long-term costs to their well-being. In addition to these health concerns, with both fishers and farmers going out of business, the decrease in traditional agricultural practices leaves cultures on the brink of destruction… [and] over four million Canadians are food insecure. In Toronto today, every third child goes to school hungry. As most people turn to food banks only as a last resort (in fact, fewer than 25 percent of food-insecure households make use of them), this means millions of Canadians are still truly down and out. We need to redirect ourselves to a truly whole, sustainable approach, vastly increasing our awareness of how we produce food. Ideally, we should focus on sustainable agriculture… The overriding imperative is obvious: we must protect all farmland in perpetuity. For 40 years, BC protected 4.7 million hectares (11,613,953 ac) of land in the ALR, but in 2014, the provincial government planned to open a majority of that land up to mining. BC still wears the crown for food insecurity. The price of farmland and the lack of support for farmers (only one percent of our provincial budget goes toward agriculture) must be addressed. David Suzuki points out that, historically, we look at a temperate forest in terms of lumber and calculate its worth simply in those dollar values. But Suzuki looks at what that forest is “worth” alive and working. He reminds us how hard a temperate forest works. It captures, filters and supplies water. It helps prevent floods. It stores carbon. It purifies air. If we had to buy those services, we’d have to pay about $2,000 per hectare (2.5 ac) per year. Farms located alongside forests experience additional benefits, including natural preservation of soil quality and natural homes for beneficial pollinators like birds, bats, a variety of bees and other insects. Of course, all this labour should increase the value we place on a forest. If we add in everything, including the recreational benefits a forest provides, the trees could be receiving over $5,000 per hectare (2.5 ac) in wages every single year. We need to treasure the biodiverse ecosystems all around us that naturally control excesses of one species over the other, instead of killing masses of life forms for assumed economic benefits – whether we kill trees for lumber or a few “pests” at the expense of many other beneficial organisms. Trees simultaneously provide shelter, preserve moisture and build soil as leaves fall and branches rot. We see this so obviously after an ecosystem loses its pollinators, so we must remember that food security – a nation or community’s access to a sufficient quantity of affordable and nutritious food – depends on biodiversity on the farm and around it. The pressures to rezone are being felt across the country, not just in southwestern Ontario and BC. Investors follow the old real-estate adage, “Don’t wait to buy land, buy land and wait.” They can pay $50,000 to $100,000 per 0.4 hectares (1 ac) for farmland that has potential for alternate use close to the city of Regina. While waiting for the land to be rezoned, they derive payback income for their mortgage by leasing the land out to farmers. Their patience is rewarded when the multi-family residential zoning goes through and their land skyrockets to $750,000 per 0.4 hectares (1 ac). As young farmers aren’t replacing older ones, the multi­national corporations are moving in, for the rising crop prices, the uncut timber and other natural resources on the land. Until we address this issue, we cannot hope to get the next generation out on the land and our chances for food security will continue to diminish. The moment we become proactive, “they” becomes “we.” We understand the suffering of those slogging it out on Bay Street, Wall Street or in the Beijing financial district. Our first and biggest obstacle is to collectively climb the mountain that is hiding what humans as a whole have lost as a result of practices like fracking and industrial farming. When a swath of big, old growth trees is slashed, we’re all reduced. We need to climb our densest peak, remove our blindfolds and take a look at the full view. From side to side, top to bottom, through the rocks, down into the oceans, we must recognize that we’re all connected, and no one human, no one being, is any greater than the next. It became dangerous to question the authorities about topics like money, religion, politics, extreme sports, wars, peace missions, intellectual pursuits, mythologies, consumerism, classism or even such basics as how agriculture can best provide us with the food we eat. As a result, many of us grew up submissive, unquestioning, alone, obese and unhappy. None of us desire such passive isolation as adults. However, by severing our fundamental connection with the world around us, we’ve dug a hole in our soul. We all need love, support and appreciation for each of our abilities and ethical intentions. If we all base our ethics on kindness and respect… we can cultivate a natural diversity that can make our hearts and bodies vibrate. As is so often the case, people are the problem – but they’re also the solution. 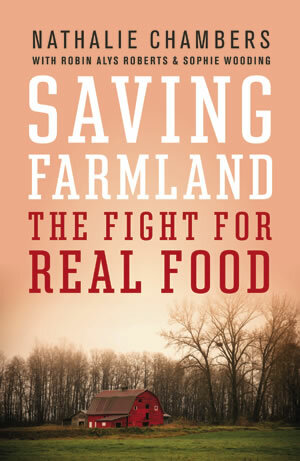 Nathalie Chambers is the founder of the Chef Survival Challenge Inc., a fundraising event for farmland conservation, and the Big Dream Farm Fund, which directs funds towards farmland acquisition and sustainable farming education initiatives. Nathalie and her husband, David Chambers, live and work on Madrona Farm, where they grow more than a hundred varieties of produce year-round for over 4,000 regular customers, including numerous wholesalers and local restaurants. Robin Alys Roberts taught at the University of Victoria and has written a manual, websites, newsletters, conference presentations and magazine articles. Sophie Wooding has a degree in creative writing and English literature from the University of Victoria. She apprenticed at Madrona Farm surrounding a stint at GoodRoots, a Community Sustained Agriculture Farm near her hometown of Langley.